Israel again has come under Philistine oppression and has become accustomed to it. Manoah, from the tribe of Dan, has a wife who is suffering from barrenness. For a Hebrew woman, this is the greatest of calamities and viewed as a mark of divine disfavor. The Angel of the Lord appears to her with a message that she will conceive and bear a son. But this announcement is accompanied with very specific instructions for the future son. He is to be a Nazirite, a word meaning “dedicated” or “consecrated.” According to Numbers 6, the vow is voluntarily and taken for a limited time, but in the case of the woman’s future son, it is to be life long. The vow consists of three specific restrictions: abstain from any grapes or grape products such as wine, or intoxicating drink made from grapes; abstain from cutting his hair; and avoid eating anything considered unclean. The uncut hair is to serve as a visible sign for both the son and the public of his consecration. The mother is also commanded to observe the Nazirite vow at least during her period of pregnancy. She is especially instructed to not eat anything unclean because carcasses were often used as food that could result in disease. Her health and state of mind are both very important in giving her unborn child the best health and a good start in life. The wife immediately tells her husband all about the visit of the Angel of the Lord and what he told her. Manoah prays, “O my Lord, please let the Man of God whom You sent come to us again and teach us what we shall do for the child who will be born.” While his wife is in the field, the Angel of God reappears to her and she runs and tells her husband who immediately comes and asks, “What shall be the boy’s rule of life and his work.” The Angel says nothing new about how to raise the child but to carefully observe all the instructions that were given to his wife. Manoah says to the Angel of the Lord, “Please let us detain You, and we will prepare a young goat for You.” Proper hospitality demands that he provide a meal for his visiting guest. It appears at this point that Manoah thinks the Angel of the Lord is a human visitor and not a heavenly. The visitor states He will not eat his food, but if he offers a burnt offering, it must be to the Lord. Then Manoah asks, “What is your name, that when your words come to pass we may honor you?” The Angel of the Lord avoided a direct answer to the question and says it is “wonderful.” The word is closely related to Isaiah 9:6 where “Wonderful” is used as a title for Christ, indicating that the visitor is the second person of the Godhead. Manoah takes a young goat, accompanied with a grain offering, and offers it as a burnt offering. The grain offering is normally used in occasions of celebration as here with the promise of a child. This offering consists of grain, oil, and incense. The grain is part of the cereal that is left in the sieve after the wheat is ground into flour. The oil is olive oil that is used in cooking and is highly combustible. The incense is frankincense that is made from a gum resin of a particular tree. The food of the grain offering is placed on a rock and burned, this changes it from an offering to a sacrifice. As it goes up in flames, the Angel of the Lord ascends with it. This serves as proof to Manoah and his wife that the Angel of the Lord is not a man, but God. Manoah’s reaction is that he might die because he has seen God. His wife reasons with him that the Angel of the Lord would not have announced the birth of a child if they were going to die immediately. The faith of Manoah’s wife is rewarded when she gives birth to a baby boy whom she names Samson. He grows and the Lord blesses him. The Lord in time begins to stir Samson into activity as he begins the liberation of his people from Philistine oppression. This contact with the Philistines is paradoxically used by the Lord in spite of Samson’s willful decision. Samson and his reluctant parents go to Timnah to make marriage arrangements when He evidently briefly leaves his parents and is attacked by a young lion. The Spirit of the Lord comes upon him and through his great strength he kills the lion with his bare hands. He does not inform his parents of the incident, perhaps because he has violated his Nazirite vow by being in contact with a dead lion. After some time he travels to Timnah for the marriage and he turns aside to see the carcass of the dead lion and finds a swarm of bees and honey in its mouth. In spite of becoming unclean, he eats some of the honey and eventually shares it with his parents without informing them where he got it. Common to most weddings at that time, a week-long wedding feast follows the marriage, reflecting the leisurely pace of oriental custom during celebrations. The literal translation of the feast is “a drinking” or “occasion for drinking,” making it difficult to think that he keeps his Nazirite vow of abstaining from grape products. At the wedding feast, the clan or village of the bride brought 30 companions for the bridegroom to support the union. Their role is unclear, but it may be for security of the bride to see that she is treated fairly in her new family and perhaps accepting financial liability if the husband should abandon her. At the beginning of the wedding feast Samson proposes a riddle that serves as a form of entertainment for the guests. 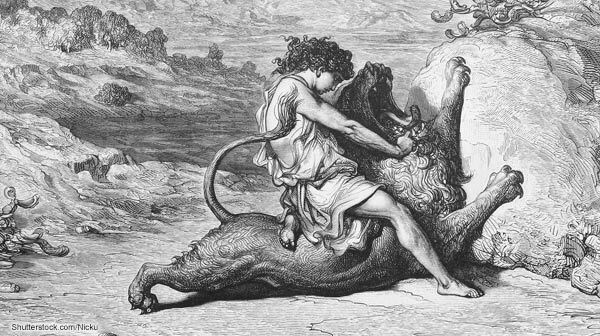 The unusual location of the honey found in the carcass of the lion gives Samson the idea for the riddle. If the 30 companions could solve the riddle during the seven days, Samson promises to give them 30 linen garments, if they cannot solve the riddle, they are to give Samson 30 linen garments. This offer is very attractive, since expensive clothes are very sought after in the Ancient Near East. If they can solve the riddle, they will think the Philistines are wiser than the Israelites. As the days of the feast go on, they are not able to solve the riddle. So on the the seventh day they heavily pressure Samson’s wife to find out the answer. They threaten to burn up her and all of her father’s house if she does not reveal to them the solution. She weeps on him and says, “ You only hate me! You do not love me! You have posed a riddle to the sons of my people, but you have not explained it to me.” In the end he relents and tells her the solution that she passes on to them. Near the final moments of the feast the 30 men come triumphantly to Samson with these words: “What is sweeter than honey? Heifers are not usually used in plowing, so the message is that they did not play fair in getting the answer from his bride. In retaliation, Samson travels over 20 miles to the Philistine coastal city of Askelon where the Spirit of the Lord comes upon him mightily and he kills 30 men, takes their expensive garments, and gives them to the 30 men who solved the riddle. He probably goes such a long distance to acquire the garments to conceal his actions. Because of his anger against his wife, he abandons his wife and returns home for a time. His father-in-law did not want his daughter abandoned in disgrace, so he gave her to Samson’s best man in marriage. After Samson’s anger subsided, he returned to Timnah to reclaim his wife at the time of the wheat harvest in early June. He brings a young goat, apparently wanting to atone for leaving his wife or just visiting his wife until all preparations have been completed for moving her to his home. He announces that he wants to go into his wife’s room, but her father announces that she is no longer his wife. Since the bride price had been paid for his wife, her father offers her younger sister as being better than his wife. Samson is not impressed with the offer and flatly rejects it. In retaliation for this turn of events, Samson catches 300 foxes or many think the closely related jackels that would be easier to capture in large numbers, since foxes hunt alone and jackels hunt in packs. He connects the tails of each two animals together with a firebrand and sets them loose in the wheat fields. This burned up the whole harvest of unharvested wheat, the shocks of cut grain, the dry grape vines, and the olive trees. This obviously angers the Philistines greatly, and they retaliate by burning his wife and her farther. In revenge, Samson attacks them with a vengeance that results in a great slaughter. Afterwards he withdraws to the cave of Etam for protection. Samson is from the tribe of Dan that received its land inheritance within the borders of the tribe of Judah. After the great slaughter, the Philistines go up in battle array into the territory of Judah at Lehi. The men of Judah ask, “Why have you come up against us?” They answer, “We have come up to arrest Samson.” It appears that they are not coming against Judah, but only to get Samson who is from another tribe. The men of Judah, wanting to avoid warfare with the Philistines, send 3000 men to arrest Samson. He bargains with them saying, “Swear to me that you will not kill me yourselves.” They answer, “No, but we will tie you securely and deliver you into their hand; but we will surely not kill you.” They bind him with two new ropes and deliver him to the Philistines at Lehi. At the end of this incident, he is exhausted and very thirsty and God supplies water from a hollow depression in the ground that revives him. After this victory he is made judge and rules over Israel for 20 years. Samson’s weakness for Philistine women again reappears as he goes to the Philistine city of Gaza and sees a harlot with whom he indulges in immorality. When the men of the city learn that Samson is there, they surround the place and wait for him at the gate of the city. At midnight, Samson arises and goes to the gate of the city to leave. It is closed, so with his great strength he pulls it up with its gigantic posts, bars, and doors and carries it up to the top of a hill on the road to Hebron. Later, he becomes infatuated with Delilah at Sorek that is about two miles from his home. Although Scripture does not state it, the general belief is that she is a Philistine because of her proximity to the area controlled by the Philistines and her constant contact with their leaders. The Philistine leaders are determined to discover the secret of Samson’s strength, so they try to bribe Delilah with a fortune if she can discover it. Each of the rulers of the five main Philistine cities offer to each give her 1100 shekels of silver or about 28 pounds if she could discover the secret. The total would be 5500 shekels of silver that would be 550 times the average annual wage—a vast fortune! Delilah begins her prying for the secret in a not too subtle way, “Please tell me where your great strength lies, and with what you may be bound to afflict you.” Her objective must have been clear to him because he begins to answer her with magical solutions that must have amused him. He lyingly answers, “If they bind me with seven fresh bowstrings, not yet dried, then I shall become weak, and be like any other man.” The bowstrings are made from intestines or sinews of animals. Delilah binds him with these bowstrings and calls the lords of the Philistines that are already there waiting for her call. When they arrive, he breaks the bowstrings as a strand of yarn breaks when it touches fire because this yarn is highly flammable. She then again begins to work on Samson with, “Look, you have mocked me and told me lies. Now please tell me what you may be bound with.” He answers, “If they bind me with new ropes that have never been used, then I shall become weak, and be like any other man.” Delilah follows his instructions, but the outcome is the same as before. Delilah persists in her probing, “Until now you have mocked me and told me lies. Tell me what you may be bound with.” He says, “If you weave the seven locks of my head into the web of the loom.” Probably the horizontal type of loom is referred to here. It has two beams supported by four pegs that are driven into the ground. Samson’s hair is woven into the fabric and fastened with a pin. When the announcement that the Philistines are coming is given, he pulls up the pin and the whole loom, departing with the unfinished cloth still in his hair with the shuttle and parts of the loom hanging to it. Delilah now begins to question the sincerity of his love, “How can you say, ‘I love you,’ when your heart is not with me? You have mocked me three times, and have not told me where your great strength lies?” These accusations penetrate Samson’s heart so effectively that he capitulates and tells her the secret is in his uncut hair because he is Nazirite. The Philistines know that shaving beards and pulling out hair is a sign of mourning but they never dreamed that cutting off hair would cause weakness. Once Delilah realizes that he has poured out his heart and told the truth, she calls the lords of the Philistines to come. They come and bring their bribe money to her. She lulls Samson to sleep on her knees and calls for a man to cut off the seven locks of his head. The seven locks are seven segments of hair bound together, three on each side and one in the back. Then she begins to torment him and says, the Philistines are upon you. Samson awakes, but cannot escape because his strength has left him. He is captured, bound with bronze fetters (very likely on both his hands and feet), and his eyes are gouged out. He becomes a grain mill grinder in prison. These are individual handmills for grinding grain into flour. They are composed of two stones that rub together with grain being fed into them. This work is shameful for him because it is normally a woman’s job. The large rotary mills that are powered by a donkey or slave labor are not invented until after Old Testament times. The Philistines have a national festival in honor of Dagon their chief deity. The word Dagon is probably either derived from the word “grain” or “fish.” Coins have been found in Ashkelon with the deity who is half man and half fish. The people attribute Samson’s capture and subjection directly to Dagon. During the celebration there is feasting and revelry as the drunken Philistines call for the once invincible Samson to appear so he might “perform” for them. The Hebrew word for “perform” has the connotation of “play with” or “amuse.” This indicates that they intended to mock him, probably because of his chains and blindness. Samson is stationed between the two main pillars of the temple, with the help of the young man assigned to attend him Samson locates the two pillars. On the roof are 3000 men and women, including the Philistine lords, watching Samson “perform.” Samson now prays to the Lord using three terms for God—‘Adonai, Yahweh, and Elohim. The first ,indicating his Lord, the second, the personal God of the covenant, and the third, the great God of power. He prays, “ O Lord God, remember me I pray! Strengthen me, I pray, just this once, O God, that I may with one blow take vengeance on the Philistines for my two eyes!” The Lord answers his prayer with strength as Samson says, “Let me die with the Philistines.” When he pushes with all his might the temple falls on the lords and all the people, killing them. With this act he kills more Philistines at his death than during his life. His death is not suicide as many think, but an act of retaliation in war. His family buries him in the tomb of his father Manoah. He has judged Israel for 20 years. In his life, he only begins the liberation from the Philistines that is completed later by David. Samson is clearly a flawed judge. He did much for the Lord, but because of his weaknesses he is unable to complete the task the Lord gives him. His flaws include but are not limited to: the breaking of his Nazirite vow, fatal attraction to Philistine women, immorality, not listening to his parents, lying, self-willed, and not obeying the Lord. In spite of all this, the Lord still uses him. Clearly it demonstrates that the Lord is merciful to flawed people and even uses them to fulfill His will. If we follow the Lord more faithfully, He can accomplish much more through us.